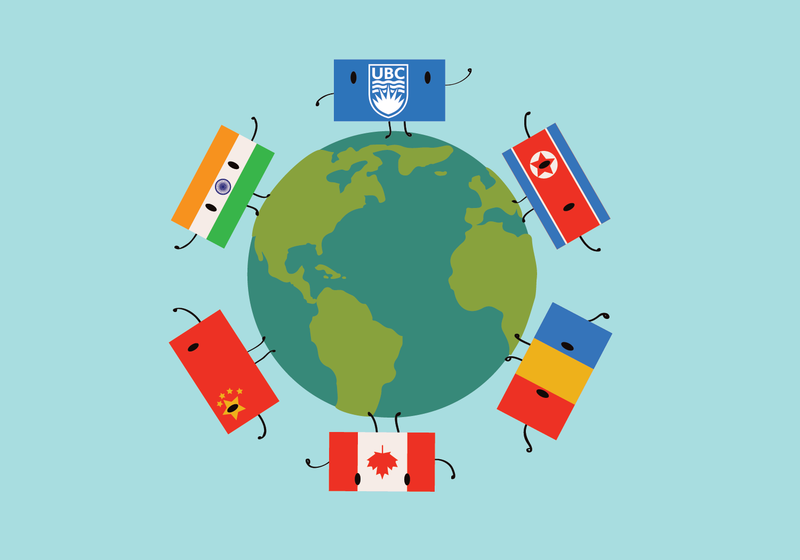 UBC isn’t shying away from world-shaping international issues. In fact, it’s seeking them out. At the end of a leafy street along the route of the 25, an average Vancouver home sits, unassuming and swarmed by reporters. As UBC students ride the bus to class, buy their beer and even live within mere blocks of her Dunbar home, Meng Wanzhou — CFO of Chinese telecommunications giant Huawei — is under 24-hour surveillance. She was released on $10 million bail following her detention in Vancouver after allegedly committing fraud and violating the United States’s trade sanctions against Iran. With China rejecting the legality of the extradition request from the United States and appearing to retaliate against Canadian nationals in China as a result, the leafy blocks around Meng’s home are going from ordinary cross-streets to the centre of the crossfire. UBC isn’t shying away from international issues like these, whether they’re dropped on its doorstep or not. In fact, it’s seeking them out. The university is pursuing a conscious and methodical international strategy that brings issues such as the Huawei affair closer to the institution’s core mission and day-to-day considerations — and it’s leading the way for universities to expand the definition of diplomacy. “We are in a very unique position to leverage the privilege that we have as being a top-30 school ... and geographically where we are situated [near Asia] to really connect with different parts of the world,” said Vice-Provost International Dr. Murali Chandrashekaran, who assumed his newly-created role last year. Global issues like the Huawei affair — with whom UBC has a partnership despite concerns raised by a previous Globe and Mail investigation that its operation in Canada risks our data security — certainly and literally hit UBC close to home. Others, however, threaten individuals at the institution. The diplomatic fallout between Canada and Saudi Arabia last summer saw the future of hundreds of Saudi students at UBC hang in the balance as they were demanded to return home. US President Donald Trump’s 2017 travel ban against citizens from seven majority-Muslim countries left the ability of many students, staff and faculty to travel to the United States unclear, prompting UBC President Dr. Santa Ono to develop a task force to monitor the situation. Touted by Times Higher Education as the most international university in North America in 2018, UBC is intently building inroads to engage with China and other significant regions, expanding the reach of the traditional university and the scope of diplomacy. Since China began its ongoing series of economic and political reforms in the late 1970s, UBC has had partnerships with universities in mainland China, largely through the Sauder School of Business. Dr. Yves Tiberghien, a professor of political science who specializes in Chinese politics and governance, called the partnerships at the time “small and targeted.” Now, UBC’s engagement with China is anything but. Under former UBC President Dr. Stephen Toope, UBC’s first international strategic plan in 2011 named China, India and Europe as areas of priority. In 2013, the university created a China Council to advise the president and senior leadership on how best to engage with China. In a country as complex and politically misunderstood as China, information-sharing is key for UBC. Aside from the country’s autocratic nature, according to Tiberghien, Chinese post-secondary institutions and government are intensely organized and centralized, meaning that any partnership with universities, corporations or municipal governments must go through the Ministry of Education. The presence of sensitive topics — like the contested statuses of Taiwan and Tibet — means the questions of how and when to engage require even more coordination, which the China Council hopes to provide. But despite these complications, Tiberghien sees engagement with China as essential — not only for research to progress, but for students to be culturally fluent as well. “If you talk to people in science and medicine, the concern that they have here at UBC is that you can’t be in the top research pools in 10 or 20 years from now if you’re not partnering with the Chinese,” said Tiberghien. China currently has the highest expenditure on higher education in the world, and composes 20 per cent of the world’s population. In 2015, then-President Dr. Arvind Gupta signed first-of-their-kind agreements with several universities in China, largely concentrated in the Southwest. Ono has since expanded these agreements in number and in scope. “If you ignore the country that has 30 per cent of climate problem and 50 per cent of urbanization dynamic in the world, you can’t solve any global problem whatsoever,” said Tiberghien. It is precisely in its reasons for engaging with China that UBC is now rooting its international strategy in issues of global relevance, rather than specific places. “‘International’ is more about issues of global relevance, issues that the university has the capacity to working with others help address — and these issues of global relevance are not just issues that manifest themselves in other parts of the world,” said Chandrashekaran, “but also here at home. “It’s how we as an institution pursue excellence in research engagement ... to advance a sustainable and just society across British Columbia, Canada and the world,” he said. He sees climate change, global public health and poverty alleviation as some of the most pressing issues UBC is uniquely positioned to help address, perhaps in ways traditional diplomats can’t. Specifically, the multidisciplinarity, diverse student body and ability to think more long-term than most elected governments are all supported by universities' abilities to be “relatively impartial” in politically and culturally sensitive scenarios — and his colleagues agree. “I still think about diplomacy as primarily based on respect and on the sensitivity that you bring into any kind of conversation,” said Dr. Anna Kindler, senior advisor to the dean of education, international and member of the China Council. And UBC is certainly working with sensitive material. Since 2010, the Knowledge Partnership Program (KPP) has seen four to six professors from North Korea visit UBC each year to study at the Sauder School of Business or the faculty of forestry. It is one of the only programs with the dictatorship in North America and doesn’t rely on any support from the Canadian government, other than granting study visas for the professors. This phenomenon is what Tiberghien and Evans call “two-track diplomacy” — academics abroad, by virtue of being perceived as more neutral than diplomats, have more access to information and opportunity to partner with governments than other foreign governments. They may also be able to connect with colleagues on academic levels to gain more insight without seeming to operate with a political motive. And while the Canadian government doesn’t object to the program, it certainly keeps it at arms length. Dr. Kyung-Ae Park, director and co-founder of the KPP, is quick to note that the program’s goal is to foster greater understanding of how to work together, not to criticize how either country conducts itself. “It’s purely academic, and it’s important to have a track-two channel to communicate when there’s no government-to-government direct channel,” she said. In this sense, UBC’s impartiality has allowed it to navigate the sensitivities of many more tense international situations — perhaps not outside of traditional diplomacy, but certainly between the lines. The university is not itself a diplomat, but it has interests to protect just the same. And much of that work starts at home. For Dr. Moura Quayle, director of the recently-created UBC School of Public Policy and Global Affairs, this means bridging the gap between academia and the public sector in order to break down the misperceptions that make snafus turn into full-blown crises. Quayle has been working with the UBC VP Research and Innovation office to look into where UBC could be partnering and better sharing knowledge through a series of recent reports. But all paths seemed to lead back to students — and notably, how students can learn to ask the right questions. “Universities have been somewhat guilty of thinking we have the answers,” he said. “These challenges that we’re trying to address, that cannot be the starting point. UBC may not have a seat at the United Nations anytime soon — but it’s certainly building its own table.